For several years now, the home for Las Vegas high stakes poker action has always been Bobby’s Room, located in the Bellagio. The Ivey Room, part of the Aria (the new casino giant also located in Las Vegas), is now set to take over this title, securing its grasp on high stakes poker. The Aria Hotel & Casino (said to be the jewel of the 8.5 billion dollar city-in-a-city complex dubbed the MGM Mirage) is a 60-storey glass palace, lying over 370,000 square meters that took five years to construct. The casino consists of 14,000 square meters and besides its showcase central room, it has numerous private rooms to provide discrete high stakes action. The steering committee’s main goal with the extravagant enterprise is probably to bring Las Vegas to its knees and to make it the central hub for all the action happening in the city. So, the plans to take over the high stakes games from the Bellagio do not come as a surprise. The Bellagio’s Bobby’s Room, being legendary among poker players, is well known for holding the most expensive and elaborate games of all times. On average, players sit down at the tables with around $200,000 to $300,000 with the blinds being $2000/$4000 and $4000/$8000 in limit games. Bobby’s Room acquired its trademark name back in 1978, from the legend Bobby Baldwin, winner of the 1978 WSOP Main Event. 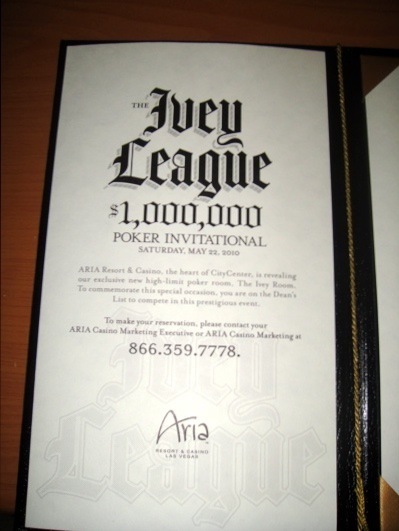 Naturally, we find that the Ivey Room acquired its name the same way, being named after the 7-times WSOP winner Phil Ivey. The opening ceremony for the Ivey Room, scheduled for 22 May, will feature an invitational poker tournament with 1 million dollars at stake. Apart from the million dollar prize pool, extra rewards will be on offer to tempt the guests: whoever busts out Phil Ivey, gets $100,000 for their efforts. The winner of the tournament will also have to compete against Ivey in a heads-up match and can increase their winnings with an extra $250,000 on top of the $250,000 first place prize. With the WSOP launching just one week after the opening of Ivey Room, it is a sure bet that the poker pros of our time will soon be pretty familiar with the Ivey Room. WSOP is literally the World Series of Poker, where players from all over the world come together to compete in an epic circuit of gambling excellence. Increase your chances of getting into the WSOP by staying up to date and collecting promo codes from online casinos, the likes of Royal Vegas. Check out this Royal Vegas review to see what kind of a place it is.